One of the things I like best about A Sunday in the Country (Un Dimance à la campagne, Bertrand Tavernier 1984) is the way it deals with time. It is the kind of film where the past and the present seems to exist almost simultaneously, and occasionally even the future appears, as if it was now. Time here is not just relative but transcendent, and the past might be as real and materialised as the present. 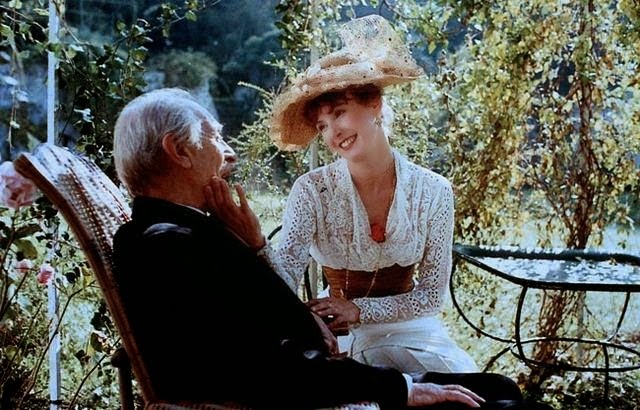 The film is set in 1910 and focused on an old man, a painter who lives with a housekeeper in a big house outside Paris. His wife is dead and he feels lonely, but on the Sunday the film is set he is visited by his son (with family) and his daughter. They play, eat and quarrel, and go for a ride in the daughter's fancy car. But every now and then there will be a scene that is set in the past, when the wife was alive, or when the children were small; sometimes past and present are combined in the same shot. In addition to this the old man's son has premonitions of his father's death and the dialogue too moves effortlessly between past, present and future. Bertrand Tavernier, who wrote and directed A Sunday in the Country, has made several films about time and memory, and how the past lives on, and this might be the one film of his I like best. It is as close to perfection as any film has come. The cinematography is sumptuous and fluent, Tavernier and the cinematographer Bruno de Keyzer use their colours to evoke the style in which the old painter might have painted, whilst keeping the camera moving and agile. The film is not trying to tell a story but to capture some truths about these people; their fears, grievances and joys. It is in turns funny and painful, and flawlessly acted by the cast, old, middle-aged and young, even the dog is perfect. 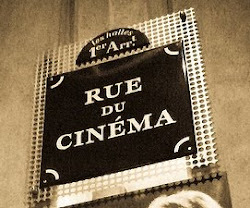 The film is sensitive to everybody's needs and regrets, and Tavernier uses the very French type of voice-over, more of a literary device used frequently by Truffaut, of an unknown yet all-knowing voice occasionally explaining the characters' feelings. The son is hurt because his sister was always their father's favourite. The father is disappointed by how seldom his daughter comes to see him. But all of them have things hidden from the others, and they do their best to get along. It is a film of great beauty. Some 15 - 20 years ago, Tavernier was one of my favourite filmmakers and I tried to watch everything he made. Then I lost track of him and I have seen very little of his work after the magnificent It All Starts Today (Ça commence aujourd'hui, 1999). But revisiting A Sunday in the Country made me remember all the films by him I have seen, not least the exceptional The Clockmaker (L'Horloger de Saint-Paul 1974) and Daddy Nostalgie (1990), with Jane Birkin and Dirk Bogarde, and eager to explore the later ones. Other films in which the structure of time becomes a quality in itself are Two For the Road (Stanley Donen 1966), the films of Hong Sang-soo, Alain Resnais, Wong Kar-Wai and often Theo Angelopoulos. Joseph L. Mankiewicz is another time artist.